Eyes shining like twinkling emeralds, the blue coat covered by a silver shine… she is moving with an unique grace and elegance but also anticipating the explosive power which sleeps in these graceful creature. They always remind the spectator of „panther en miniature“ which appear in blue colour. Russian Blue: The substance of which catdreams are made of ! Whoever fell under their spell and once found grace in these deep green eyes, will hardly resist the enchantment, which is going out from this race. Already in the 8th Century the formally as „blue cat“ designated race was native in the northern parts of Northnorway, Northfinland and some northrussian countries. Even the Vikings had a liking for the blue „Russian“, which is reflected by the exhibition of clothes in the Parisien Viking Museum. By different examinations scientists found out that the gloves and capes of the nothern seamen used in these times had been made out of blue catcoat. So you can suppose that the Russian Blue cat had lived already around 830/840 A.D.. Nobody knows today if it were also Russian Blues, who pulled the golden waggon of the mother of earth Freya – mentioned in the old nothern tales – , or if perhaps the precursors of the norwegian woodcats did this job… a nice idea anyway ! Nicer at least than to imagine that the Russian Blues could be used as coatsuppliers for collars, hats or additional garnment in Siberia and be bred for these purposes. More nicely also the thesis that these cats had tight eyebrows and eyelashes to prevent snow getting in their eyes during walking through the steppe. Because of the Vikings, who loved to set out on a trip and to conquer, the first specimen of these cats arrived really early at England, Spain and Malta. Due to this the blue cats got names like „Maltesian Cat“, „Spanish Blue“ or „Archangelsk Cat“. This last name surely because of England, which had already in the year of 1553 trade relations with the harbour of Archangelsk. Wood and precious coats and leather were shipped from this harbour, and of course these ships were accompanied by cats; they had to obstruct rodents to destroy the valuable freight. In this way the blue cats came as „blind passengers“ to Northengland. Nowadays the cats would have real problems to get on the island because of the strict quarantine regulations ( Great Britain is free of rabies and wants to keep that status ). ( Great Britain usually prescibes a quarantine of three months for cats to keep the island free of rabies ). That tom-cat propably came from a northrussian ship and decided to do the same as his ancestors and conquer the world as a blind passenger. The people which gave him a new home in Scotland could observe that his coat was especially dense and plushy. This conspicious dense and slightly from the body sticked out hair concluded that the cat lived under inhostible climatic conditions in Russia. After a year staying in the more moderate latitudes the coat had adapt to the changed demands. It wasn´t that dense anymore and layed for that reason closer to the body. Also in the old nothern tales and songs the blue cats had their defined place. Scandinavian songwriters wrote down old songs, which already were 400 to 500 years old, around 1300. For the most part norwegian bards paid homage to cats as close friends to the mankind, who cleaned up farmyards from mice and rats and thereby ensured a good crop. For that the cats received a warm place in the stables and sometimes even a good filled dish of milk from the fjordfarmers. In this way a symbiotic relationship came into being between men and cat. 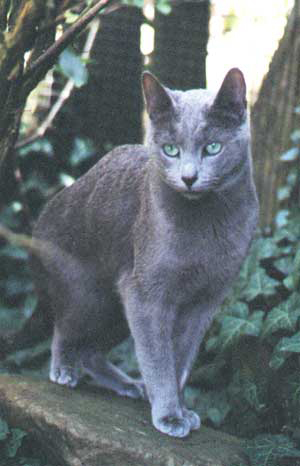 The existance of the Russian-Blue-Cat „Vadka“ at the Russian czarcourt is certified at around 1850. Czar Nikolaus I. was a proven big friend of the Russian Blue Cat, and the high nobility became also followers. The Russian Blues became that popular that they were allowed to sleep in the same rooms together with the czar´s children. There are stories that tell that the nannies put the emeraldeye beauties on top of the beds of the children to keep away evil ghosts. These stories aren´t just tall tales, as the photo-documentation by the former laidy-in-waiting of the czarina, Anna Wirubowa, can prove. These photos substantiate that at the Russian court a big, grey cat was kept, who shared the bed together with the son of the czar. If this cat kept away evil ghosts from the czar´s scion – who knows? The warmth and the tender hum of the animal at least did surely the best for the boy. In 1901 Queen Victoria of England and her son Edward VII. received a very valuable present of the czar: A breedingcouple of Russian Blues came from the czarcourt to the royal family to England, because also the brits couldn´t resist the fascination going out from this blue elegance. Therefore the breeding of Russian Blues in England came under the royal patronage and Edward VII. even took the chairmanship of the first breeding association in which the breeders of this race became organized. A big career for a cat which actual wasn´t anything more than a usual housecat of the cold, nordish countries. The Russian Blues are really good conformed to life in these cold regions anyway. They have a double coat and its structure is comparable to the one of nordish dog-races. Top hair and under hair are equal long. The coat protects the animal of soaking and severe coldness. 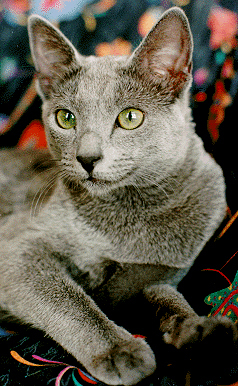 Another unusual characteristic is the bluelike, dark skin of this cat. You can observe that dark skincolour at a lot of animals living in these cold regions. It protects the animal of additional loss of body temperature. In 1893 Mrs Careew-Cox from South-Walden, Essex, imported a cat named Olga from Archangelsk to Great Britain. This was the mother of her breeding tom-cat Bayard ( born in 1898 ) and formed together with Fashoda ( imported in 1896 ) and Yula ( imported in 1901 ) as well as the father of Bayard named King Vladimir the tribe of her breed. With the further developement of the breed and the integration of this new Foreign Blue in the row of the shorthair races many problems had to be overcame. 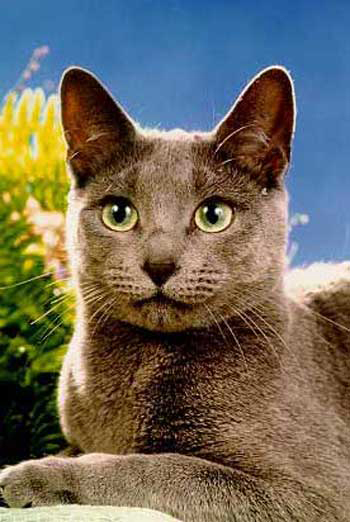 The British Blue and the Chartreux already existed as blue shorthair races, and the breeders of these races surely wanted to take in the Russian Blue´s gene pool. Last but not least it succeeded to establish the Russian Blues as an own race. World War II was a bad decisive moment – also in the breeding efforts of the Russian Blues. If men have to fight to survive, breeding interests surely are pushed into the background. So it was no surprise that especially in Swede and the Netherlands Siameses were bred in after the war. This brought an improvement to the eyecolour but the quality of the coat and the build disadvantageous changed. Maria Rockford, who already started the breed of Russian Blues ( Cattery „Dunloe“ ) before the war, was one of the leading breeders who tried to keep the original characteristics of this race. Carrer of a model ? – Succeeded! 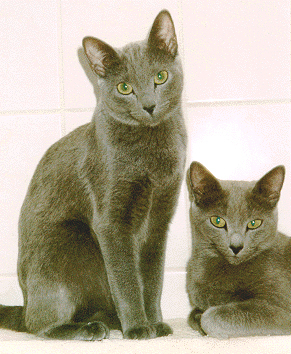 Meanwhile committed breeders are working europewide on the preservation and improvement of the Russian Blue. With success! Also the advertising industry became attentive to the special charisma of the greeneyed beauties. A german automobile producer let an emeraldeye Blue run through his compact car – the aim was a white mouse – and also on the placards of a big veterinary pharmaceutical producer the eyes of a „Russian“ shine. In this way the slim blues managed once more to beat successfully the competition of the orangeeyed British Shorthair with their rounder head and their plump build. „Russians“ are very social cats but also own a highly distinctive dominance behaviour. Kept in a group they need enough room to avoid each other. They are very skillful climbers and jumpers, who also enthusiastic accept an open air enclosure. Watching them hunting and romping in the nature you will get the impression of a real big cat – that powerful and elegant are their movements. Russian Blues select their men by themselves. Most of the times they aren´t anybody´s friend. But if you once captured their love it will last for a lifetime. They are fond of their holders with a tender love and also are abandoned cuddlers. As mothercats they are for usual first class. The babies are tenderly cared for by their mother and educated with a soft voice; even catfathers have been watched intensively caring for their coming generation. Such a litter is doing a lot of pranks and to resist the view of these babyblue eyes is nearly impossible. Around the 6th and 8th week the eyecolour of the babies start to change. First into dirty-yellowbrown before they are getting into a glorious green. Some kitten, however, get directly green eyes without showing this „brown-phase“. Small kitten often have light ghoststripes in the coat which dissapear later on. 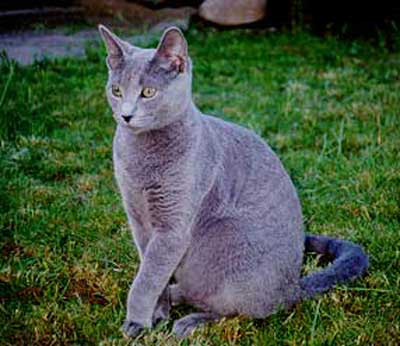 The coat of an adult Russian Blue should shine in bright bluegrey without any stripes and should be coverd with a silver shine all-over the body. This silvershine comes into being because of light-reflections on the unpigmented end of hair. 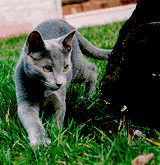 If you are interested in getting a Russian Blue, inquire a reliable breeder. Vaccination against catcold and catepidemic should be obvious, also regular protections against worms. Insist on a family tree issued by an acknowledged breeding association. A bloodtest for FeLV and FIV is also important as an actual health certificate. With good care, much speech and characteristic meals of the species, protected by regular vaccinations your friendly, soft „Russian“ will accompany you for a long time in your life. She will be a faithful companion for you who you don´t want to miss anymore. 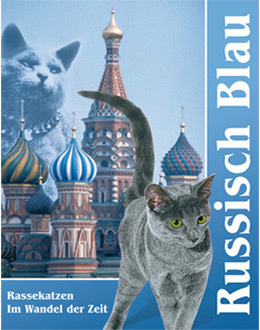 For the most of the Russian-Blue-friends the motto is valid: Once Russian Blue – Ever Russian Blue ! It won´t be anything else to you ! !